Bedrooms: 4 double Bedrooms, with an option to convert the Dining Room into a 5th Bedroom with 2 single beds, and/or to add a single bed to either/both Bedrooms 3 and 4. 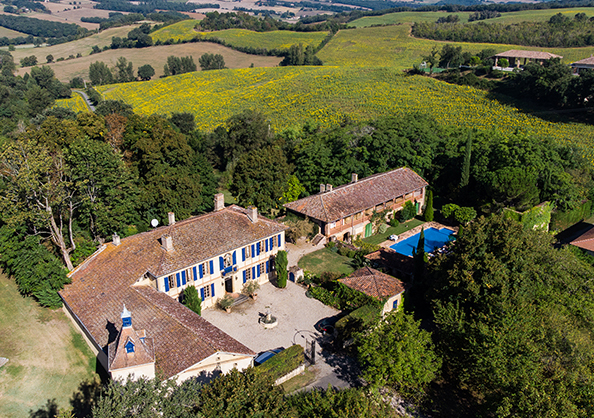 Key features: Located in the Gers, the stunning, unspoilt region west of Toulouse. Swimming Pool which can be heated if requested. The beautiful 18th century “Château de Gaujac” is on the edge of the tiny village of Gaujac, and is in the Gers, the département to the west of Toulouse and part of the historic region of Gascony. This is very much an agricultural département, and is particularly unspoilt, well known for its foie gras, Armagnac and its relaxed life style. Because of its rolling, picturesque countryside, it’s often called “Little Tuscany” (‘Le Petit Tuscan’). The Château is situated off a small, very quiet road, the D223, which leads to Gaujac. It’s approached by magnificent iron gates, opening onto a courtyard (with masses of parking space). It stands on a hill in about 20 acres of rolling lawns and gardens, with lovely, shady trees of many varieties. There are stunning views of the countryside around and below it. On one side of the courtyard is an unused Pigeonnier (dovecote), plus a barn. On the far side of these buildings is a church which used to be part of the Château, and which has an occasional service. This is an “all-year-round” house, cool in summer and warm and comfortable in winter. The Château usually sleeps 8 in 4 double Bedrooms with, in addition, an option to convert the Dining Room into a 5th Bedroom with 2 single beds, or a single bed to be added to Bedrooms 3 and/or 4. All rooms on both floors have high ceilings, and there are shutters on all the windows. The Music Room. With a sofa and armchair, a Bluthner baby grand piano with sheet music, a non-working fireplace, and two large east-facing windows through which streams the morning sun. There’s an MP3 CD player, a radio and a separate record player. There are also some CDs. The shutters on the window overlooking the piano should be kept closed whenever possible to protect the highly polished veneer of the piano. The Sitting Room. Very large, with 2 generous-sized sofas, 2 armchairs, and a wood-burning fireplace. (There are logs beside the fireplaces in both this room and the Dining Area, and a stack of logs in the nearby woodshed. There’s a giant TV screen with a satellite connection, and a Blue Ray DVD Player. Beyond the Sitting Room is the Laundry Room with a clothes-washer and a dryer, a roller and a steam iron, as well as one of the hot water tanks and the boiler. At the rear of this room is a W.C. N.B. The Laundry Room also connects with the Dining Room, and the W.C. is therefore essential should the Dining Room be converted into a 5th Bedroom. Dining Room. With a table seating 8, two long, east-facing windows, and a non-working fireplace. There’s a cupboard containing board games, packs of playing cards etc. Kitchen/Breakfast & Dining Area. Air-conditioned, with a large central “island”, separating the Kitchen from the Breakfast/Dining Area and with, above it, racks for pots and pans. The Kitchen has a Siemens induction cooker with 5 hobs, 2 Miele ovens, a Nespresso machine, a large toaster, weighing scales, a large fridge/freezer with ice-maker, a dishwasher, and a sink. Breakfast/Dining Area. With a table seating 8, an open, wood-burning fireplace, a long north-facing window, and a door leading to the Terrace. Wide stairs ascend from the Hall to a spacious Landing with a sofa and French windows. All the Bedrooms are of generous dimensions, and have fans and hair-dryers. Bedroom 1. Air-conditioned, with a 6-foot double bed, an armchair, a non-working fireplace, and 2 long, east-facing windows. There’s plenty of cupboard space in all the Bedrooms. Ensuite Bathroom 1. With a bath, a hand-held shower, 2 washbasins, and a W.C. Bedroom 2. A 6-foot double bed, 2 sofas and a west-facing window. Ensuite Bathroom 2. With a bath and a hand-held shower, 2 washbasins, a W.C. , and a west-facing window. Bedroom 3. With a 5’6” double bed which can be converted into 2 single beds, a sofa, and a non-working fireplace. Ensuite Bathroom 3. With a bath and a hand-held shower, 2 washbasins, windows facing north and east, and a W.C. Bedroom 4. With a 6-foot double bed which can be converted into 2 single beds. A non-working fireplace, and 2 long, north-facing windows. Ensuite Bathroom 4. With a bath, a hand-held shower, 2 washbasins and a west-facing window. On the sheltered Terrace outside the Kitchen door is a rectangular dining table seating 8. With 2 large parasols, a door leading to the garden, and steps ascending to the First Floor of the “Dépendance” (the Annexe). Further steps descend to the Swimming Pool area. The splendid, filtered, salt-water Swimming Pool has Roman steps at both ends. It’s 39 feet by 26 feet, and ranging from 3 feet to 8 feet in depth. The Pool area is gated, and the gate can be kept shut. (The salt-water content helps to keep the pool clean and to protect the eyes – it’s about strength of human tears). Beautifully framing the pool are trees and shrubs and a lawn, and along one side is the 2 - storey “Dépendance” (Annexe), on the Ground Floor of which are stored the sun beds and ancillary equipment, whilst above is a generous-sized Sitting Room with massive sofas and armchairs. Thirdly, the Dépendance has a large room with a table tennis table, net, bats and balls. This First Floor is a great place to relax! On the other side of the pool are a number of partially used rooms, in one of which is a pool holding a collection of giant, multi-coloured carp. There are 8 sunbeds, a number of tables and chairs, and a large parasol. If requested, the Pool can be heated at a charge of £120 per week. Behind the house is a west-facing garden with a hammock. Lawns and trees of many varieties and shrubs descend to the wood at the far end of the property. The views of the countryside are magnificent. On the other side of the little-used road at the front of the Château is a second garden – east-facing. At one end is a large ‘boules’ court which, whilst owned by the village of Gaujac (and seldom used by its residents), is available to the tenants. The ‘boules’ are kept in the Château. A gate leads via a pergola to further lawns and trees, including a croquet lawn. These descend to a large field beyond the property’s boundary. There are wonderful views to the east, with The Pyrénnées to be seen to the south. There are several ponds in the garden and grounds. Parents are therefore advised to keep a strict eye on their children. There is a portable, charcoal-fired barbecue. “Château de Gaujac” is 6 miles from Lombez and 7 miles from Samatan (both in the same direction), and 6 miles from Saramon. All 3 have reasonable shopping facilities including a supermarket, a petrol station, and restaurants and bars. Recommended restaurants in the vicinity are La Table d’Olivier, Bouche à Orielle, and Château de Barbet. Toulouse’s airport (Blagnac) is 40 miles. The nearest entry to the A 64 Autoroute is at Muret (34 miles). The nearest TGV station is at Auch (20 miles). There are 4 double bedrooms, each with an ensuite bathroom and a W.C. In addition, 2 extra guests can be accommodated in single beds by converting the Dining Room into a 5th Bedroom. (There’s a W.C. beyond it). Alternatively, a single bed could be added to Bedrooms 3 and/or 4. A baby cot with bedding and a high chair are provided. A welcome pack is provided for tenants on arrival. Bed Linen, plus bath and pool towels for each guest are provided free of charge, and will be changed on a weekly basis. “Chateau de Gaujac” has WiFi/Broadband internet access, plus telephones in Bedroom 1 and in the Hall. The WiFi code can be found in the information book. The owner’s insurance policy requires that the burglar alarm is set when all tenants leave the property at any time. Before doing so, all windows and outside doors must be closed, as well as the door leading to the Laundry Room. Instructions for operating the alarm are in the Information Book. If leaving the property for a night or more, all shutters also need to be closed. The cleaner is employed by the owner for 3 hours per day on 2 weekdays. Any extra cleaning hours should be arranged directly with her, and will be charged at Euros 11 per hour. As long as sufficient notice is given, a cook and/or a baby sitter can probably be arranged. Maintenance of the garden and grounds and the swimming pool is the owner’s responsibility. There are many English language books throughout the house, as well as packs of playing cards and board games. The beauty and variety of the surrounding countryside make it a photographer's and a painter’s heaven. Auch, the capital of the Gers, is well worth a visit, if only for its stunning cathedral. Toulouse has many art galleries, museums, world-class opera and music, as well as top-quality shops and restaurants. It’s also renowned for its Space Museum, plus the fascinating tours of the nearby Airbus factory. Ski-ing in the Pyrénées is 2-hours' drive, Biarritz and its beaches are 2 to 3 hours’ drive. There are a number of “brocantes” (bric-a-brac shops) and “vide greniers” (attic sales) in the vicinity. There are several golf courses in the area. The nearest is at “Château de Barbet” (9 holes), about 5 kms drive. Full details are on their website: www.golf-barbet.com Tel: 05 62 61 96 61. There are 10 tennis courts in Samatan. www.tcsave.com Tel: 06 61 81 23 21. There are riding school at Samatan, offering individual and group lessons. www.les-ecuries-massiot.fr Tel: 05 62 62 55 04. There’s kayaking and canoeing on several local rivers. There are tourist offices in Lombez, Samatan and L’Osle-en-Dodon where much useful information can be found. The best local market, taking place on Mondays, is in Samatan. On Tuesdays, Thursdays and Saturdays there’s a market in Auch. On Fridays there's a lovely (small) market in Simorre, whilst on Saturdays there’s one in L’Isle-en-Dodon, and on Sunday mornings there’s a small market in Lombez. Bicycles can be hired from Valanciel Club in Samatan. The bicycles, with electric assistance if required, are rented @ Euros 18 per hour for half a day, Euros 25 for a full day, and with special rates for longer rentals. Tel: 05 62 62 36 64. There’s a monastery/nunnery at Boulaur near Saramon which has beautiful sung services on a regular basis. During the summer there are high quality music festivals in the locality. Details are to be found in the Tourist Offices. Marciac has a world-famous jazz festival at the end of July/early August. Mirande has a renowned country and western festival. The restaurant Bouche à Orielle in Simorre has regular jazz and rock evenings. The stunning town of Lectoure has thermal baths, and a museum describing the history of wode, which made Toulouse’s fortune. Here also is the Château of the Counts of Armagnac. The Abbaye de Flaran has ‘son et lumière’. Vic-Fezensac has « Corridas » where the bulls are not killed, plus a salsa festival. There are marvelous walks all around the property, some indicated by signs. There are maps in the house. All other months are negotiable. Unless otherwise agreed, all rentals will begin and end on Saturday, and will be for a minimum of one week. Tenants should arrive between 4pm and 5pm on the commencement day, and leave no later than 10 am on the agreed day of departure. They will be met on arrival by Nathalie Michel who will show them around. A deposit of 25% of the rent will be payable to Anglo French Properties Ltd on signing the Rental Agreement, with the balance to be paid 6 weeks prior to the commencement of the tenancy. A Booking and Security Deposit of £500 will also be payable to Anglo French Properties Ltd on signing this Rental Agreement. This will secure the booking, and will cover the cost of (a) telephone calls made on the landline during the tenancy, (b) pool heating, if required, @ £120 per week, (c) replacing/making good any losses, breakages and/or damages incurred during the rental, and (d) any exceptional cleaning work which may be required at the end of the tenancy. This Deposit will be refunded (less any deductions as outlined above) within 4 weeks of the tenancy’s conclusion. Tenants should advise Anglo French Properties Ltd at the end of each rental of any breakages, losses and/or damages. This is in lieu of an inventory.